Manitoba is a prairie province. Just to make that clear to those who don’t know. It is a flat province for the biggest part. It is definitely not a place where you would suspect hydro dams and waterfalls. Yet, Manitoba produces 90% of its electricity by hydro-electric dams. Dams like Seven Sisters or its predecessor, Pinawa Dam provided electricity for the city of Winnipeg. This raises questions for many people outside Manitoba or Canada. How can a flat province have enough difference in altitude to produce hydro electricity? 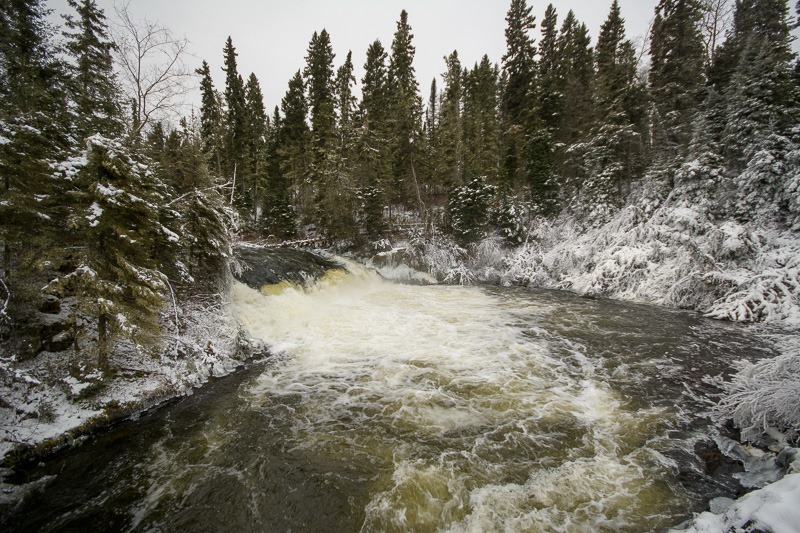 Let’s take a look at the waterfalls of Manitoba and see if there is no site steep enough for power. 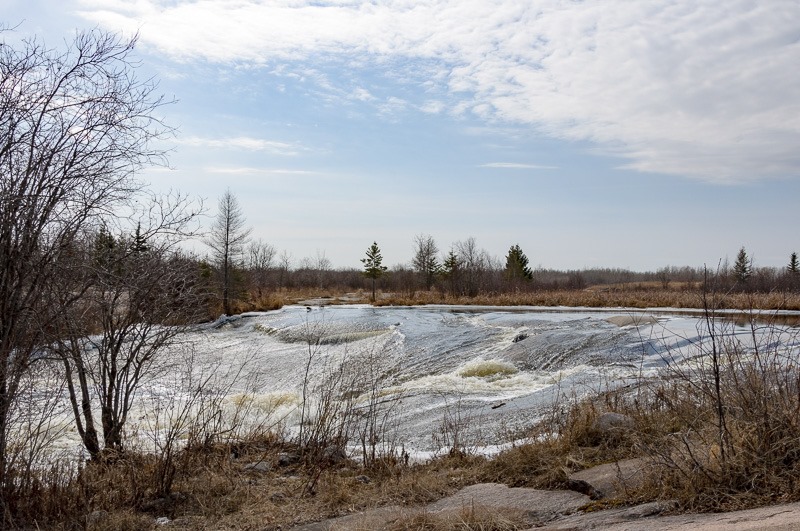 I started to prepare this post a few years ago, when I presented the Old Pinawa Dam in a series of posts, like here or here. At that time, my idea of waterfalls had been shaped by the mighty waterfalls of Switzerland and France. Pinawa didn’t come even close to the specification of a waterfall. But however little the difference in level was, it was more than enough to supply the City of Winnipeg with electricity for nearly fifty years. My question still remained. 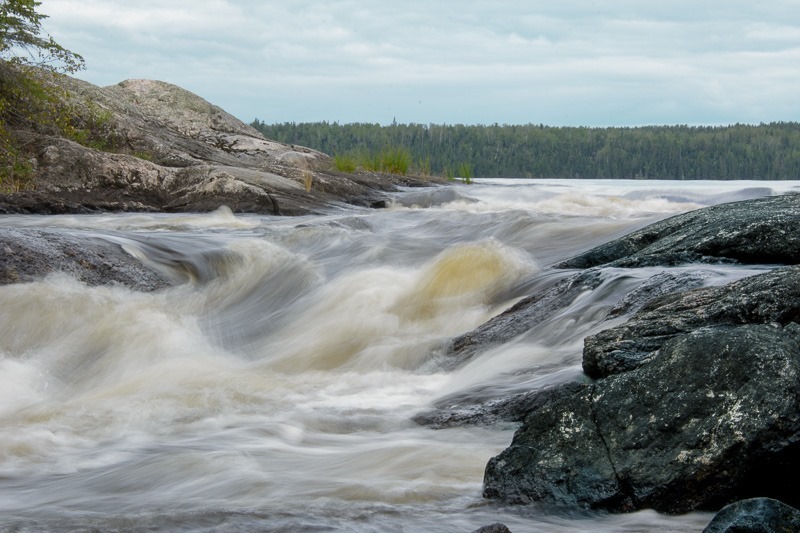 Were there any natural waterfalls big enough in Manitoba to be called “Falls” and have some visual interest? Building a dam and spouting water from there is a beautiful sight, but it doesn’t do it for me. So I went looking for Falls. 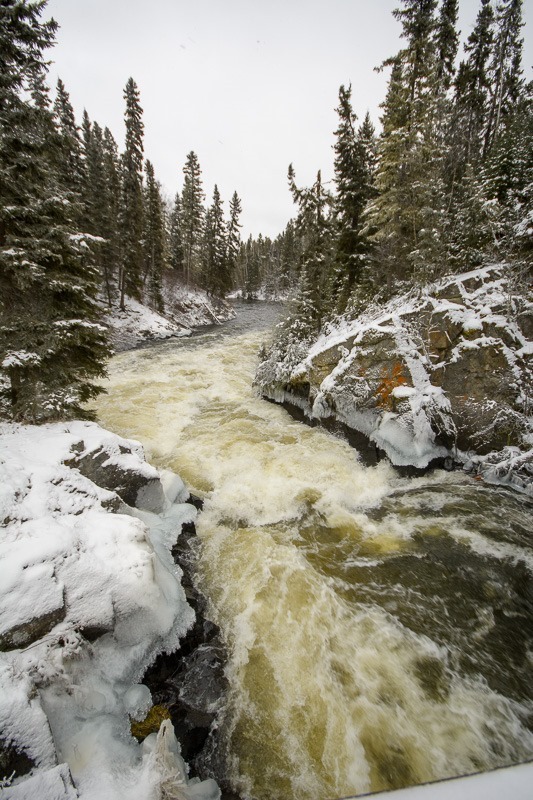 The first one to come up and relatively close to Winnipeg was Tulabi Falls. A very nice place at the south end of Nopiming Provincial Park. The falls are between two lakes, one emptying in the other. A nearby resort provided food to get through the day. After that I heard about other falls, but way too far out of my way to go there for a day trip. Until a friend of mine proposed to go on a Wild Woolly Weekend. I’m always in for something wild, I didn’t see the woolly part though. As it turned out, it was just to get dressed warm for the weekend as we would be sleeping in the car, to save some loonies. We left on a Friday afternoon and spent the night in the car, as promised. The next morning led to Pisew Falls, of which I had heard, but never got close enough to visit them. In summer, this is a beautiful place to relax and have a picnic. In winter, however, the same place turns to magic. 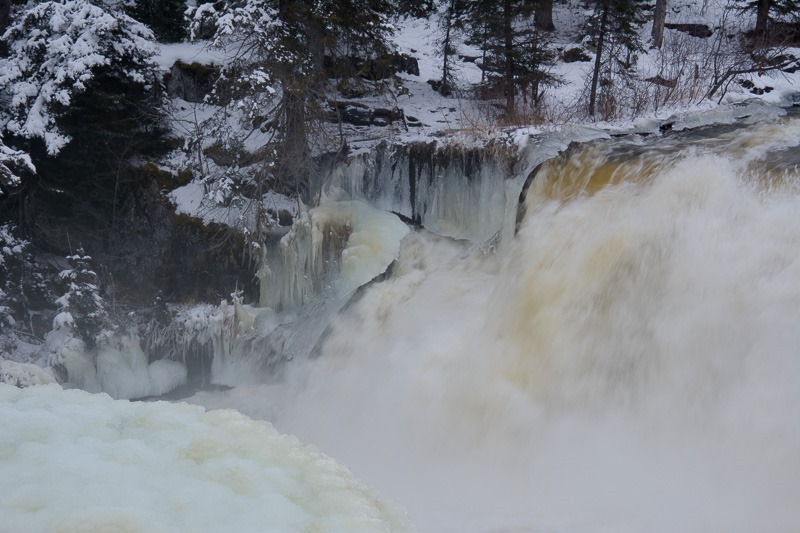 The falls give off a lot of steam from the warmer water; vegetation is then covered in permanent hoar frost. 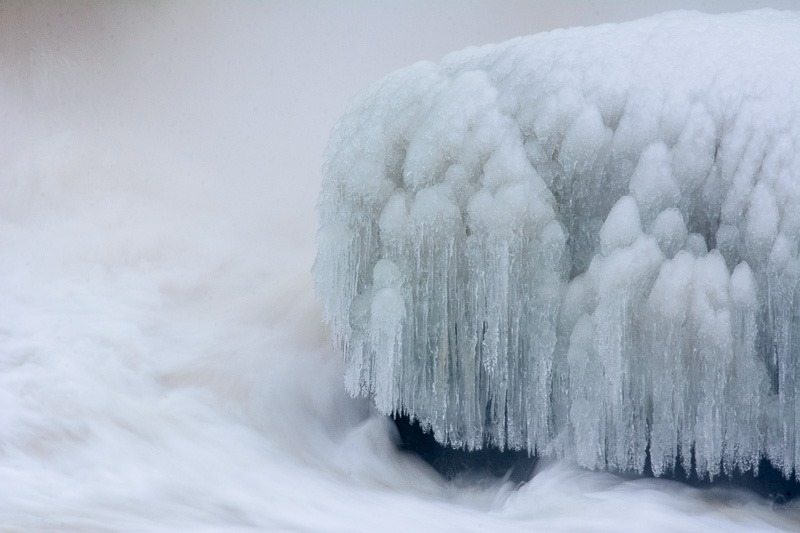 Ice formations take on the weirdest forms. When we got there, it was barely 9am, just before sunrise. The sun comes up late in the north in winter. A drop of several meters is what provides the falls with their magic. The noise is wonderful and somehow soothing. Ok it’s not a birdsong, but calming nonetheless. Then it was time to move on and go about the business we set up for the weekend. The business involved a lot of kilometers on the road and few breaks. Until we saw a sign for another waterfall. It called for a break. The weather was not very cooperative for the lighting, but since we were there, there was nothing we could do about it. One takes the light that is provided in photography. Adding some extra light would have required a large 38 ton truck with power equipment. Something I forgot to bring along. At first I thought these were just some “rapids” and that the “falls” part was just in the naming. The Grass River or sweet herb tumbles into a narrow gorge just on the right of the above picture. 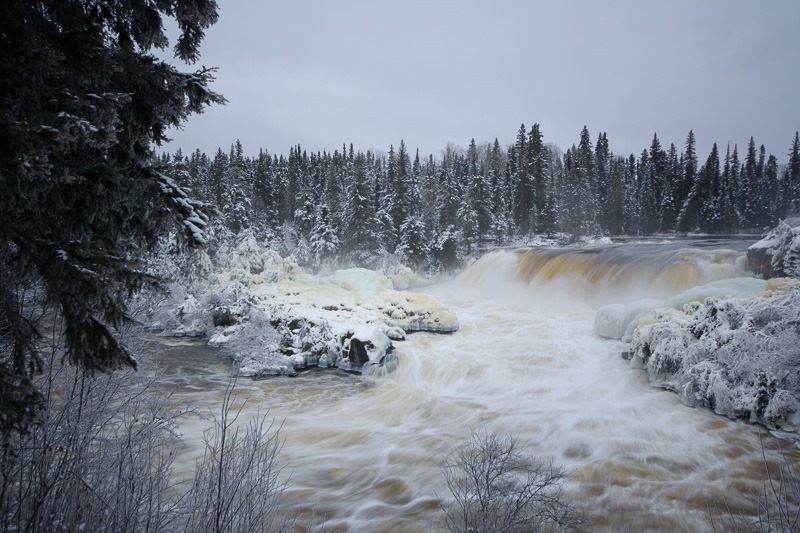 Wekusko Falls or Falls of the Sweet Herb River is the place. 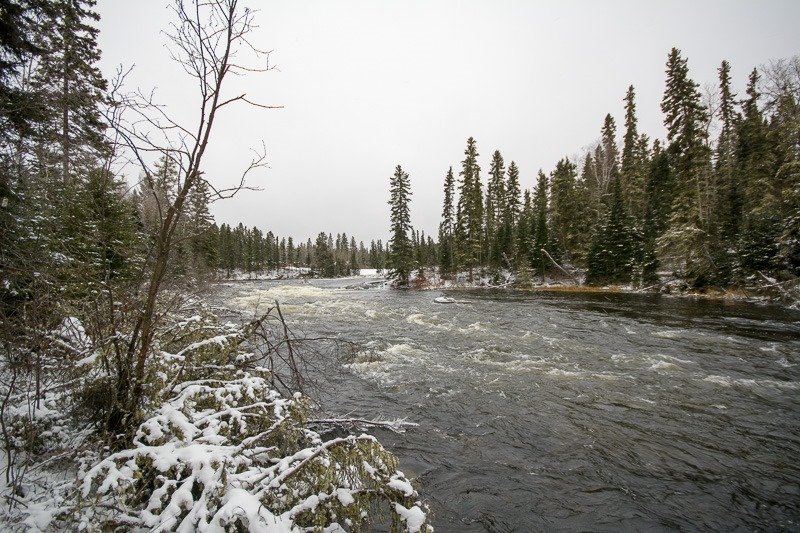 As another Provincial Park, this place must attract lots of people during the summer months. As it was, we had the place to ourselves and our cameras. To get this kind of picture, I had to cross the fast flowing water. At the risk of my life and my equipment, I swam through the icy water to the other side. I took the swaying bridge over the falls to get to the other side. 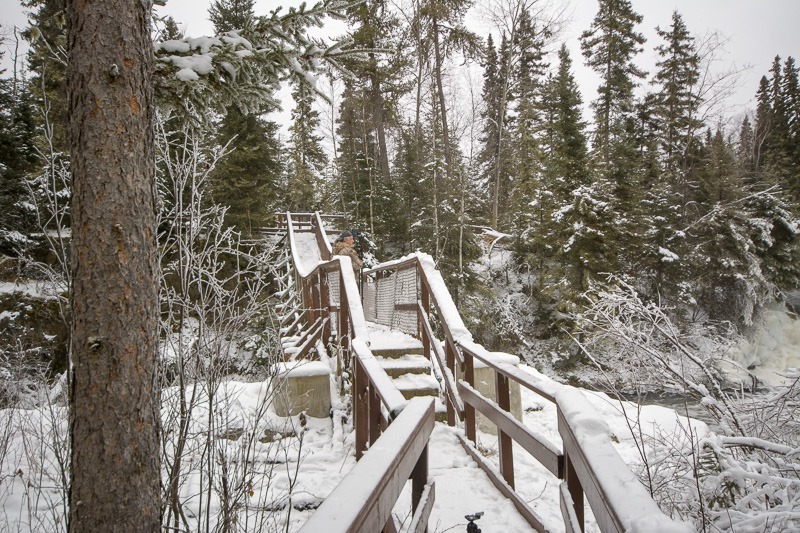 The bridge was built by the Royal Canadian Engineers in 1965 with materials donated by the Hudson Bay Mining and Smelting. The bridge was refurbished in 1991 by the engineers. Looking downstream, the wild water didn’t seem to calm down very much. The work on the bridge must have been arduous in 1965. This was definitely worth the name of “Falls” in my book. 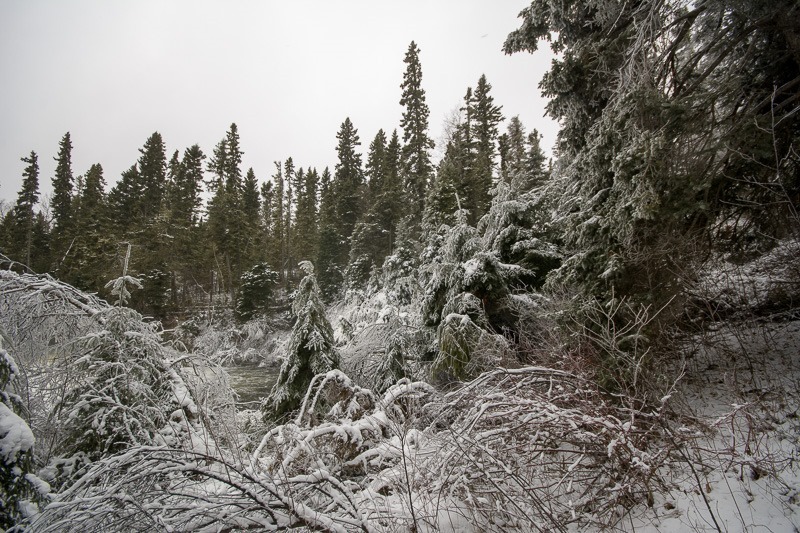 Here too, the water didn’t freeze over during the winter and the warmer temperature of the water made for permanent hoar frost on the surrounding vegetation. In some ways this looks kind of creepy, but when I was there, no creepiness was apparent. Waterfalls in flat, prairie Manitoba… Yes it’s possible, if you know where to look and if your car can go that far. The beauty of Manitoba has no boundaries. One has only to go out and look for it. Even if there were no birds in view here, the scene alone was worth the trip up north. Something I will most definitely repeat with my family one of these days.